Bright, colourful manuscript in German, written by the Nuremberg scribe IL and illuminated by Renaissance master Nicholas Glockendon, a friend of Albrecht Dürer who used Dürer's printed Small Passion series for inspiration. 134 x 94 mm. – 4 + 201 leaves. With 23 full-page inserted miniatures. The work of Nikolaus Glockendon of Nuremberg (c. 1490/95-1533/34) is generally considered among the masterpieces of German Renaissance art. He was the foremost German illuminator of his generation, and belonged to a family of Nuremberg artists who – for at least three generations – illuminated manuscripts and worked in other artistic media. He was famous for his ability as a colourist, achieving 'a sense of celebration through shading, gold highlights, and bright hues'. 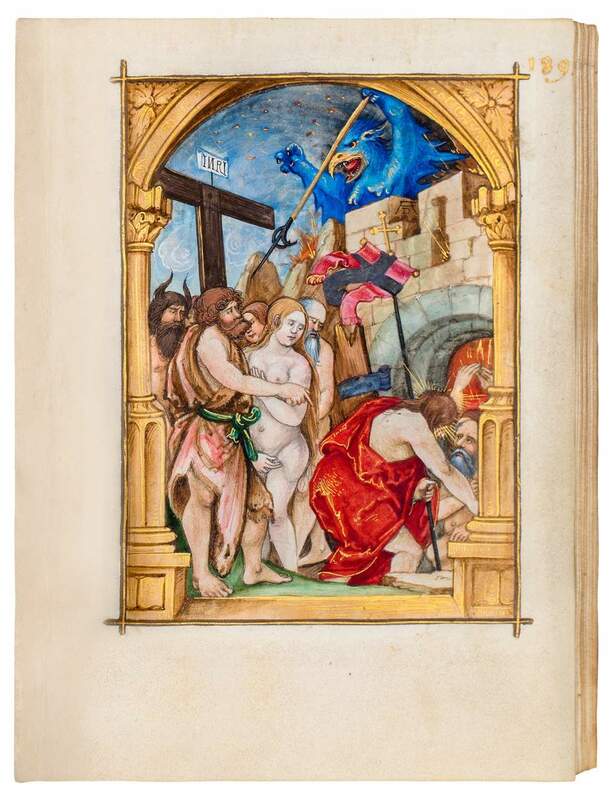 The significance of his miniatures can be measured in the artistic context of Nuremberg, more specifically of Albrecht Dürer, whose Small Passion series of woodcuts served as a model for the present miniatures. Compared to Dürer's woodcuts, Nikolaus Glockendon made his figures more corpulent, and his rounder faces have softer physiognomies. He applied a wide range of expressive colours and added subtle gradations of shadings and fine hatching. Dürer's trademark signature AD on ten of the miniatures, however, were probably added later in the 16th century. The book is dated to 1521 and presumably was made for Hieronymus Holzschuher (1469-1529), burgomaster and patrician, member of one of the oldest families in Nuremberg. We know him also from a fine portrait painted by Albrecht Dürer a few years later (1526). An early provenance to Hieronymus Holzschuher would be extremely interesting, but can only be confirmed by circumstantial evidence. An entry and signature of 1584 in front of the book, shows that the codex was owned by Ferdinand Hoffman (1540-1607), Baron von Grünbüchel and Strechau. This Austrian nobleman and Burggraf of Steyr (1575-1584), who from 1586 onwards was at the court of Rudolf II in Prague, was one of the most important bibliophiles of the 16th century. His collection consisted of approximately 10,000 volumes, including the library of Hieronymus Holzschuher (1469-1529). Holzschuher came from an old Nuremberg patrician family, had studied in Italy and became a member of Nuremberg's city council and later its mayor. In 1498, he married Dorothea Münzer, daughter of the physician, geographer and humanist Hieronymus Münzer (1447-1508), who collaborated on Hartman Schedel's World Chronicle. Holzschuher himself owned a library of about 500 tomes (including the c. 150 volumes of his father-in-law Münzer). The collection remained in Nuremberg until it was sold to Hoffman, who then added his name and signature to the front flyleaf of this highly important Nuremberg manuscript, the production and use of which brings us closer, via his direct neighbours, to Albrecht Dürer in more than one way. See also our Spotlight on Nicolaus Glockendon.